The posts below came from Ian Simpson’s (@familysimpson) Postach.io blog – Caffeine Tangent. Each heading links to his original post. Thanks again to Ian for letting us share! Before the keynote on Thursday I was able to wander a little along what I want to dub “vendor alley” – the line of commercial showcases and stalls outside the majority of the session rooms. I spoke to Appazur Solutions first. They were promoting a parent and student engagement platform which was packaged as a school-branded mobile app. Last year a colleague at RGC investigated the need for a bespoke mobile app over a mobile web site and decided that the web site was more cost effective. I’m concerned that established PIM solutions such as Outlook or Google Apps for Education might already have the bulk of the bases covered, but I’ll check it out at a later date. 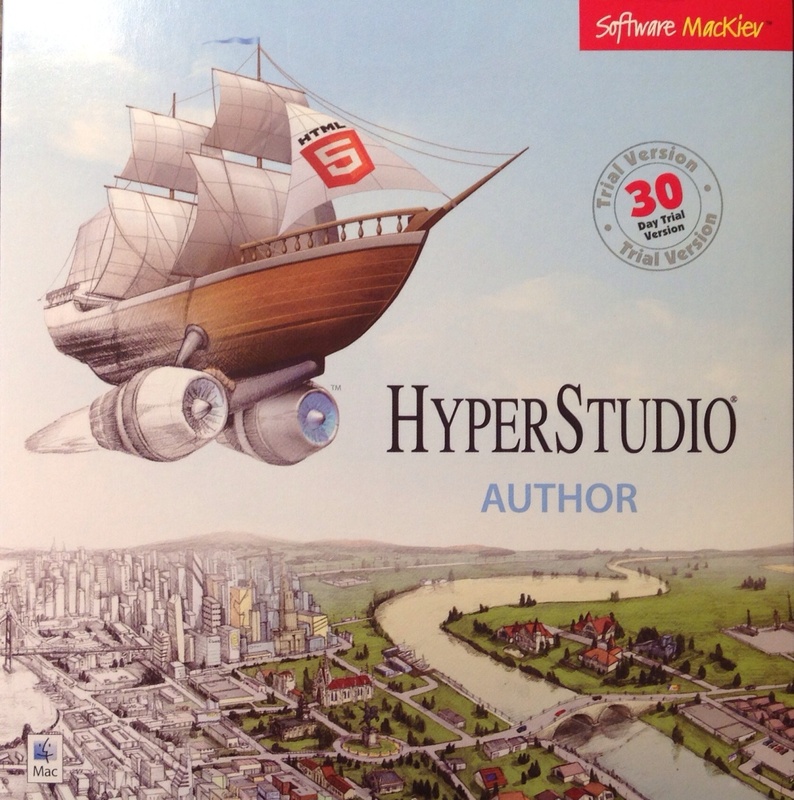 I then visited the MacKiev stand and scored a 30-day trial of HyperStudio Author for MacOS. If you remember hypercards then you know the basis of the system, however it includes 21C multimedia options that allow the preparation of interactive presentations by the teacher or student. This software (not available on iPad) allows the creation of eBooks from a finished presentation which can then be viewed on through iBooks. There is also a version available for PC computers from their website www.hyperstudio.com. The demo I saw did not look too dissimilar from an Explain Everything project with transitions and buttons to change the mode of navigation from linear to web-based. 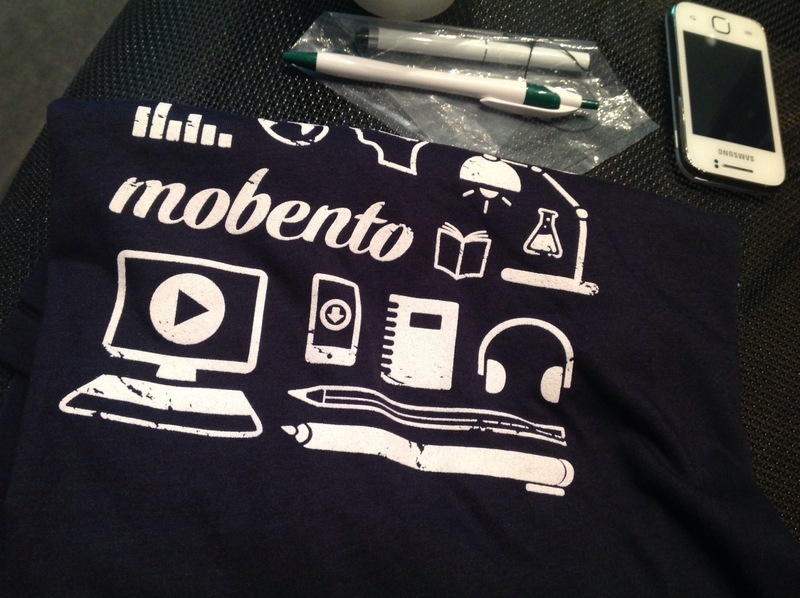 I was lucky enough to win a tee-shirt at the Mobento stand, but freebies were not the incentive to stop there. 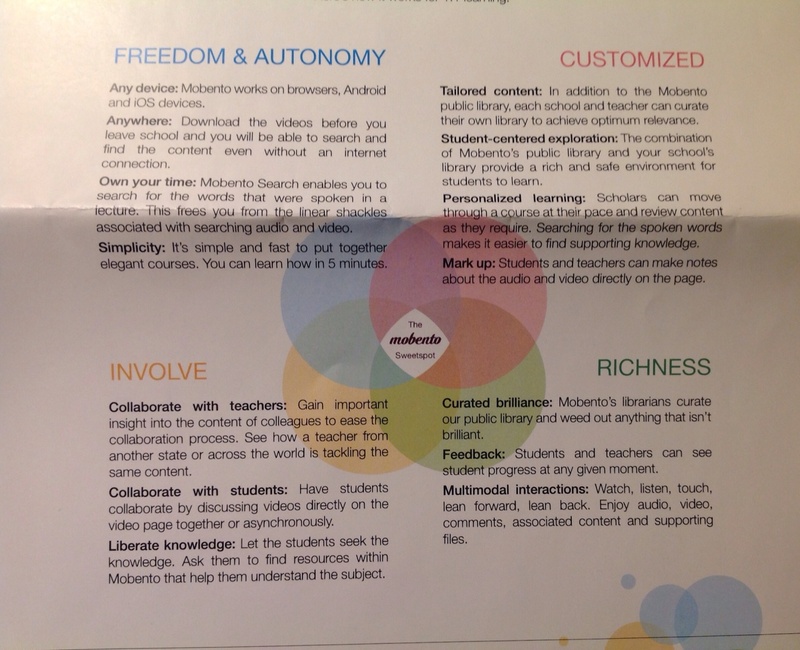 The Mobento video learning system works through a browser to give students access to video content which has been curated by a teacher, school or via its own public library. I was really impressed with the idea of searching for a specific word uttered in a video lecture and being able to see on the timeline where that word was said. The idea behind this feature is that teachers can scrub to points in the video to check its level of suitability for the lesson. After the engaging but quickfire ThingLink session I spoke with representatives from The Answer Pad, Showbie, Exploros and Bulb. It was great to be able to speak to, on the most part, the creators of the app and speak to them in more detail about the service they offer. The Answer Pad was particularly interesting because we had been talking via Twitter. I liked the way that you could create formative and summative assesssments using the web app and push it to the students in a similar way to Socrative. However The Answer Pad differs in that free-drawing responses are also available (a bit like nearpod, but with less structure needed). A long conversation ensued as I wanted to know if it supported the accessibility options available via Adobe Reader and how long data could be stored for a student – “lifetime accounts”? A new version is coming out in January 2014 and it’s definitely a service to consider with regard to digital assessment. 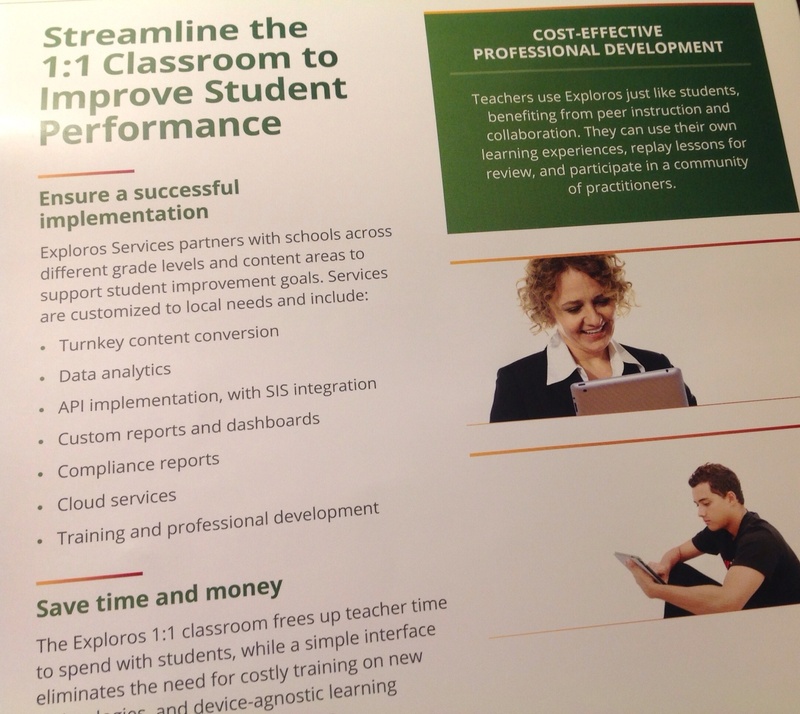 Exploros allows teachers to transform their existing print or digital content into student-facing digital learning experiences. I liked the idea of a real-time dashboard for the teacher which shows student progress graphs and assessment maps but also is a way for students to signal for attention if needed. A browser based system, the courses can be accessed by students at home and I think could be an interesting way to structure, deliver and gain valuable feedback from internal staff CPD. They are currently looking for school districts, individual teachers and learning experience authors to partner with in a pilot program. Showbie was familiar to me because Fraser Speirs uses it as part of the teacher workflow at Cedars School of Excellence. It is a repository app that manages the push of files to students and gathers their responses in date order. This means that any changes to a file appear higher up the list than the original. I was surprised to hear that the school account offers more than the individual teacher account, so I’ll be trying that out very soon to see if it can become part of our workflow over, for example, Edmodo, Google Drive, Dropbox, Copy or eBackpack. Bulb looks a little like pinterest, but is an eportfolio / blogging system where teachers can group student sites into classes and share lesson plans etc. with them via the teacher blog. One of the advantages of Bulb is that it exports to an ePub format so, as well as looking attractive through the web app, it can be accessible to teachers and students offline and in a format they are able to read, digest and annotate. I feel this one may be launching itself into a over-saturated market, but will reserve judgement until I’ve tried it out for myself. I’m hoping it will surprise me. I also managed to speak to the owners of Subtext and asked them if it was coming to the UK! Turns out it is in their plans, but won’t be available for a while. In the meantime they have a beta version of a web app at http://web.subtext.com which is available worldwide. 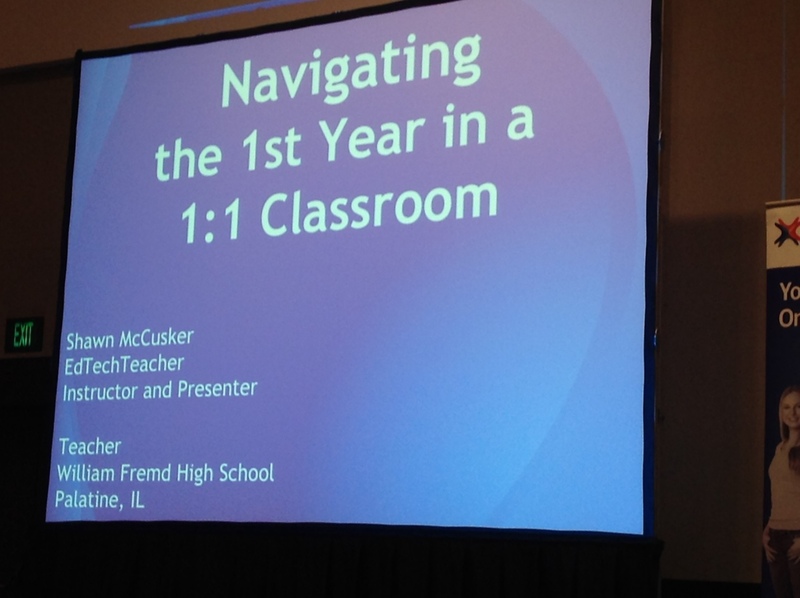 What is your idea of the perfect 1:1 classroom? 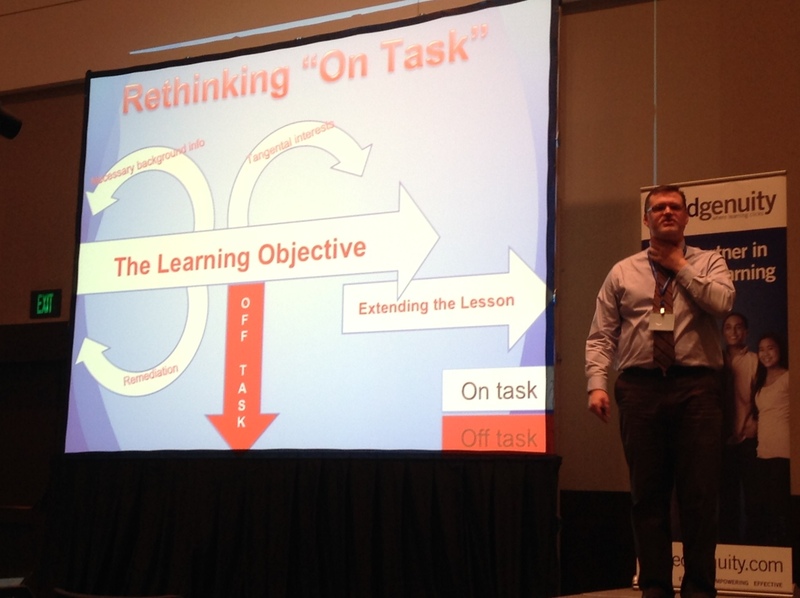 Picture a hard working, individualised classroom – then build backwards from there. Why? You have to let your vision drive the iPad. 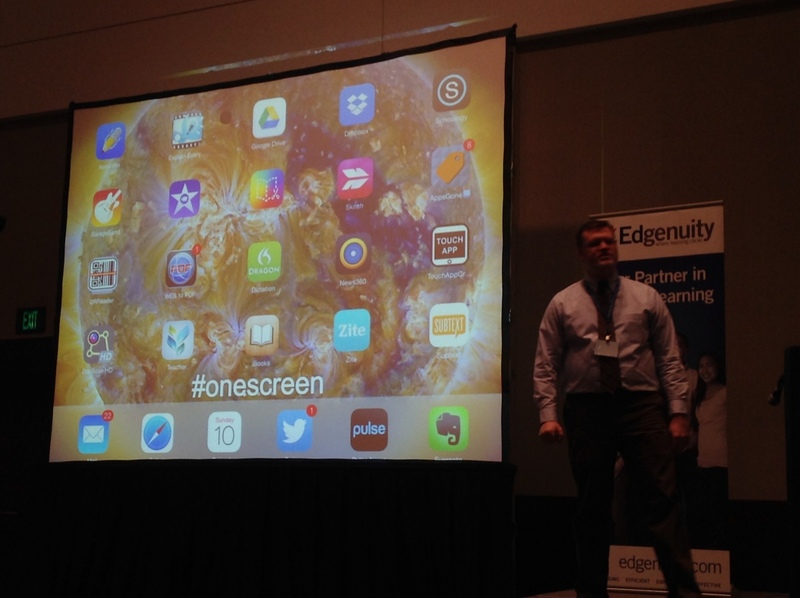 If you don’t work this way then you end up with iPads in a classroom, not iPads in YOUR classroom. The iPad is a tool, not the focus. If it interferes, put it away. If it becomes the focus or the end point, put it away. Technology is a platform that propels you forward. Embrace how it supports the identity in your class. Students didn’t know who their teacher was. Eyes were on the iPad. Day 1 is important for creating a culture in the classroom. Discussion about relationship between students, teachers, content. Content has a relationship with content from different time periods. “Peer pressure is more powerful than you”. Empower the students to find the content. Know your learning objective as a person. Time is not saved through iPads, it is just redistributed. 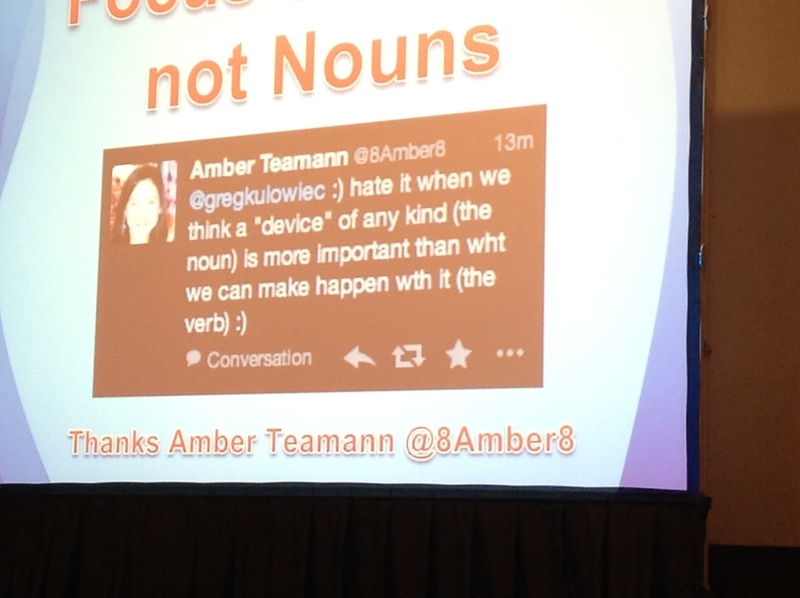 Don’t devalue teacher identity – set priorities. If your school has not had these conversations, go and make them happen. Some problems aren’t yours to fix in the classroom. 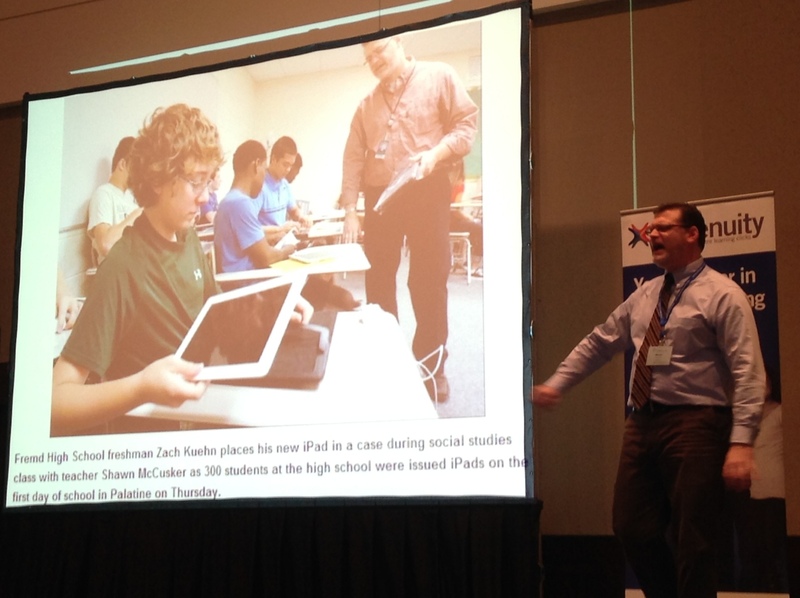 Redefine the iPad as a learning tool. “We don’t post our full names online because…”Patrick Larkin – used to be “what if people can find out information about my kids”, now we worry that people can’t find information about us if we are going for a job interview. Construct with them – coach and fade. You have time! Don’t plan it all for August. Digital natives are a myth. Kids are fearless – this is good and bad. Every student contributes then teacher curates their takeaways to share a unifying experience. 9 . 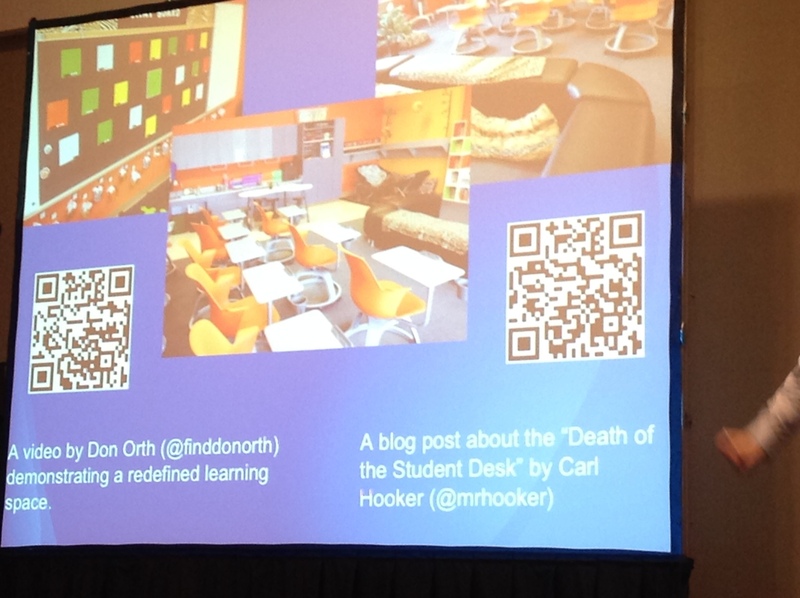 Does the physical learning space reflect the work and relationships in your class? You don’t have to rearrange your room, rearrange your day. Movable furniture?! In a library?! Shh doesn’t fit with collaboration. How do you learn? Create that environment.